Zhouzhuang information: therequirements concerning your stay, included instructions about tours and appropriate solutions for rooms arrangement. 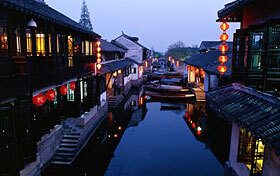 Hotels: Zhouzhuang and China reservation centre, convenient hotels at cheap prices. 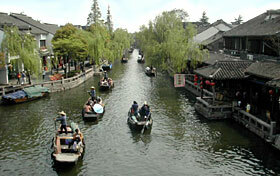 Travel: you can update about Zhouzhuang tours to discover her highlights and to visit the famous tourist lands in the surroundings. Zhouzhuang is one of China's most popular Water Village ancient town, "China's first Water Village," the Monuments of senior high historical, cultural and ornamental value. 2003, senior Department was awarded the UNESCO Asia-Pacific "cultural heritage protection Prize" in the same year won the first "history and culture of the town" title. The famous attractions are recommended as Chengxudao Hospital, Hong Fu Bridge, Mi floor, Cheng Lake, the entire Fuk stresses Monastery, the whole Fortaleza, Shen room, the double bridge, Ye Chu cang former resident, Zhang Office, Zhenfeng Bridge, One of eight landscape-- the Northeast landscape, One of eight landscape-- the south-west landscape.